The SATA24LA1 Left Angle (90-degree) SATA Cable features a standard (straight) SATA receptacle as well as a left-angled SATA receptacle, providing a simple 24-inch connection to a Serial ATA drive, with full SATA 3.0 bandwidth support of up to 6Gbps when used with SATA 3.0 compliant drives. Constructed of only top quality materials and designed for optimum performance and reliability this 24" SATA cable is backed by our lifetime warranty. 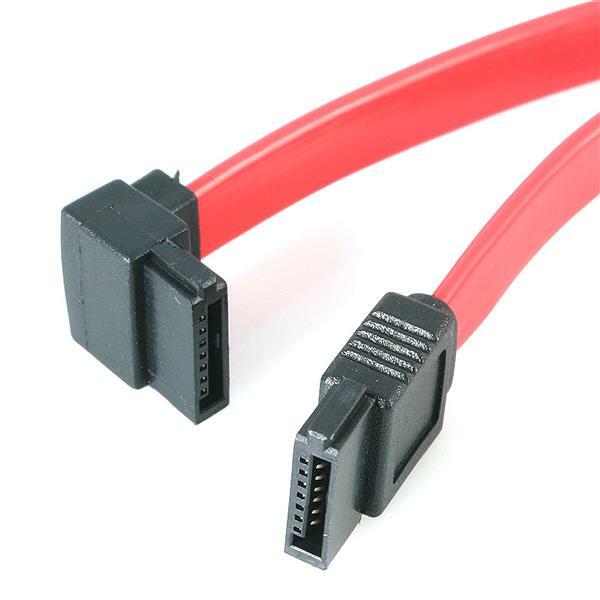 As an alternative, StarTech.com also offers a 24in Right Angle SATA cable (SATA24RA1), which provides the same simple installation as this left angled SATA cable, but allows the cable to connected to the SATA drive from the opposite direction.